Note: If you are concerned in any way about your knees or other health conditions, check with your doctor before doing this workout! Why climb stairs for exercise? Think about it, people all over the world are stuck in office buildings for work. Right outside their office door is a great workout waiting to happen beneath the heels of their feet (notice the emphasis on heels here)! Let's face it, excuses abound when it comes to exercise! Adding to the excuse list is the gym is far away, inconvenient, or it's too hot or cold outside to walk or run. 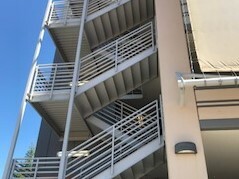 Many of these stairwells are air-conditioned, simply cooler or warmer than outside, protected from the sun, rain or even in allergy season, protected from pollen! Yes, on the perfect days, get out and exercise! But on those not so perfect days, consider the office stairwell! Outdoor parking garage for shade and fresh air! Climbing stairs for exercise can be one of the best exercises for cardio/respiratory health, muscle building and coordination. Full body workouts can be designed around using either home stairs, stadium stairs, parking garage stairs or office building stairs. All levels of exercisers can create workouts that will allow them to build at whatever pace they choose while creating more body power. It’s not just for the very fit, but for beginners as well! And, one of the great things about doing these workouts is that it can be done right in your office building either before work, after work or on your lunch hour. Hint: Buy a cooling towel and keep it around your neck to prevent excessive sweating! 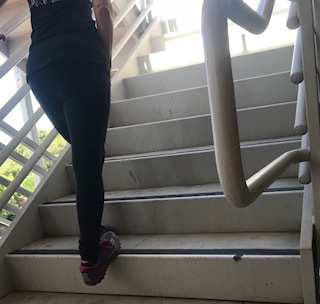 If you are overweight or unable to run or bike for other reasons, one of the best ways to build muscles and increase your heart rate and increase breathing rate is by climbing stairs. By simply walking up stairs your heart rate and breath rate will increase. The longer you walk up the stairs, the more the pulse/respiratory rate will go up so office buildings and parking garages that allow for long, continuous climbs are best. By increasing your heart and breathing rate, you help to build your cardio/respiratory health, increase lung capacity, improve circulation and movement of lymph fluid (thereby improving the immune system). You can monitor your heart rate using one of the many watches available like FitBit and Garmin. However, keep in mind you should pay more attention to your perceived exertion because many of the devices can be slow to catch up to the actual heart rate. Keep reading to find out how to protect your knees! 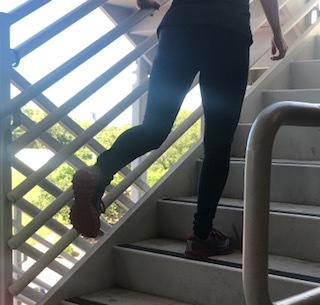 Even if you are not a beginner or are already running or walk/jogging, climbing stairs is a great way to both build muscle and improve your cardio/respiratory health which will improve your overall running ability. 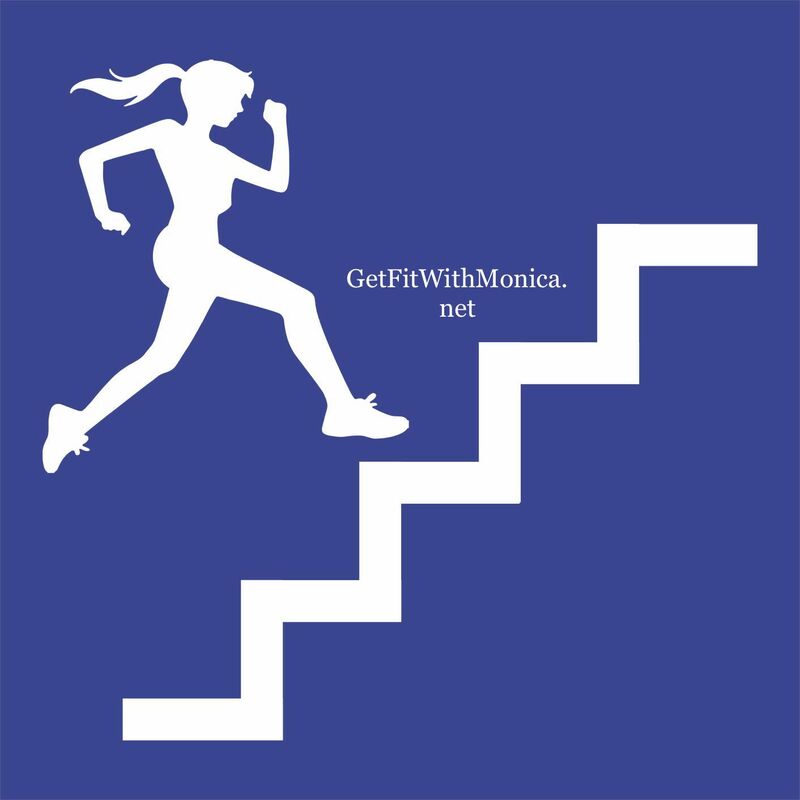 When you run up stairs, running flat surfaces will begin to feel much easier and your pace will improve over time. One thing to keep in mind is protecting your knees. You can help to protect your knees off the stairs by strengthening your hamstrings and glutes with various floor exercises and gym equipment. Do this on the stairs by focusing your attention on keeping your weight in your heels and not pushing off on your toes too much. 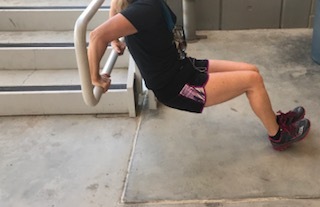 Think of it this way: pushing off on your toes will use more of the quadriceps, and keeping the weight in the heel will use more of the hamstrings and glutes. Overdeveloped quadriceps and underdeveloped hamstrings are one of the leading causes of knee injuries. 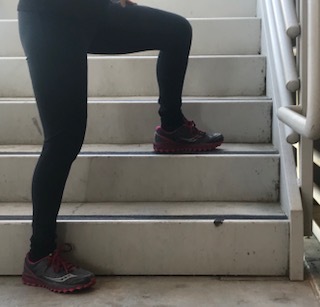 After your glutes and hams become stronger and your overall stair run/walking gets better, you can then push more off on your toes, which creates more speed! Last but not least, you should push yourself, but also feel comfortable with the level in which you know you can handle it safely. The more you practice, the more secure you will become in what your body can handle.There's a saying, "It never gets easier, you just go faster," which basically means it should never be easy and you should keep pushing! 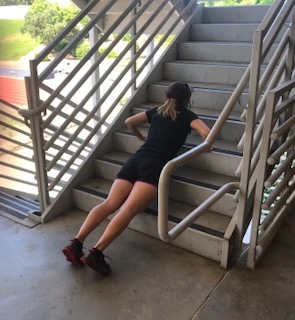 This workout for stairs focuses on using stairs in an office building or parking garage; however, remember that there are many different ways to take the stairs to allow for a full body workout and still protect compromised muscle groups. One staircase level in this workout means if you go up one level, you will be on the second floor. The next level will be the third floor, etc. 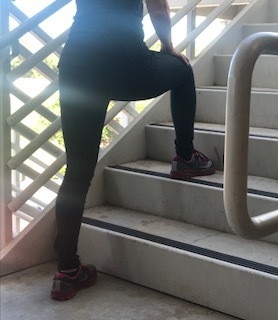 Beginner’s Guide Stair Workout "The Steps"
Warm up by walking, moving side to side, or even skipping (when no one is looking). Put one foot fully on a step, putting the weight in your heel, which helps to take weight off the knee. Now walk up as many levels as you can without stopping (again keep the weight in the heel). Of course you should stop if you feel unsteady or dizzy at any time. Check your time and remember or record it. Repeat one time and check your times. If you notice you fatigue earlier between levels, only climb to the level where you felt fatigue on the next round. Repeat dips and pushups after each descent. As a beginner (first time), you should only do your ascents about 2 to 3 times max, although you may feel you can do more. Often, the next day you will feel soreness particularly in your calf muscles. Allow about 48 hours or until any soreness has subsided, before doing it again. Check your soreness the following day after each workout to see if the soreness is decreasing. You can increase the number of ascents, levels, or the intensity (going faster) when you notice this decrease in your soreness level. If you have less time, and feel safe doing so, go faster! Try to vary the workouts, after doing them awhile, between focusing either on intensity, duration, or frequency (number of times per week), or combining all! And remember, ALWAYS warm up before, stretch after, and protect your knees in the ways demonstrated. Try a stadium workout when you are not at work! One of these long stadium stairs typically will amount to between 2 to 3 flights in 1 travel upward!